We’ve all had the terrible mornings with our children not wanting to do anything, including hopping into the car to head to preschool for the day. If you’re like many of the other parents suffering from the non-excitement of preschool, it’s time that you learn ways to get your kiddo excited! If you’ve been following our previous blog posts, then you already know that we’ve been giving you the top 10 tips to get your child excited about preschool. Here are the final three. Enroll your child in extracurricular activities. One way to get your kiddo excited is to enroll them in an after school program. 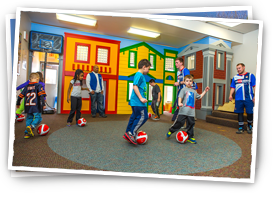 We have programs at The Growing Kids Learning Center here in Goshen, but we also recommend signing your child up for a sport! Kids love playing soccer, T-ball or gymnastics. If they’re not into sports, you can look into science adventure clubs in our community. There are plenty of activities your kiddo would love to do. This way, they will look forward to their sports or club after the school day is over! Show why preschool is relevant to them now. They may be a little young, but it’s never too soon to start prepping your kiddo for the “real world.” Encourage your child that they need to learn many different things that they’ll use when they’re grown-up! Always compliment and encourage your child. Your child won’t be excited for preschool if you’re not excited for them. Make sure you’re encouraging them day in and day out about preschool and what they’ll learn that day!